Preparing a foaling kit – are you ready? Ready or not? 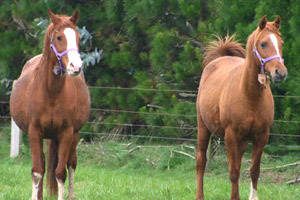 Note the shape of the mare on the right, who foaled less than an hour after the picture was taken. The southern hemisphere foaling season is upon us. Are you prepared? Neil Clarkson reports on getting a foaling kit together. The bellies on those broodmares are getting bigger by the day. Then you notice the other subtle changes that indicate foaling is getting close. If you haven’t already prepared your foaling kit, it’s time for immediate action. A foaling kit is not just about assembling the items you may need in an emergency. It is about having everything at hand to deal with many of the normal matters you expect to face during and immediately after a foal’s birth. A veterinarian once described birth in horses as an explosive process. Given that most foals will be born within 10 minutes of their forelegs emerging from the birth canal, it’s only natural that everything you need should be at hand. Part of the equation centres on the experience of the horse owner. Foals should receive a tetanus antitoxin injection. Are you comfortable giving an injection? If so, buy the injection from your veterinarian and have it ready. If not, you’ll presumably be calling the vet the morning after the birth to give the injection, and check the mare over at the same time. Regardless of your experience, discuss the impending birth with your vet. Does he know the mare? Does she have any health issues that concern him? Are there any specific medications he feels you should have on hand? Be sure to give the vet the expected birth date. It’s the least you can do, considering you may be on the phone at some ungodly hour if things don’t go right. A list of key contacts and phone numbers on a stiff piece of card (a piece of paper might blow away). It should include you vet’s numbers (including an after-hours and cellphone number), and anyone else you feel you may need in an emergency. Perhaps it’s a friend down the road willing to help if you need assistance. A torch with fresh batteries. Eighty per cent of mares will foal after dark, so the last thing you want to be doing is groping around in the dark. There are head-mounted LED lamps available for as little as $NZ20, which will give you light while freeing up your hands. Remember, cheap batteries don’t last long, so splash out and spend a couple of dollars more for alkaline. A fully charged cellphone or a cordless phone, if it has the range. No phone is any good if the battery is flat. Get a system in place that ensures your phone will never be flat. Perhaps that means always having it on charge whenever you’re inside at home. Some breeders give the foal tetanus antitoxin and antibiotic injections. If you’re not comfortable giving a shot, the vet will need to call by and do the deed. Remember to store them in the temperature range recommended on the packaging. Wormer. Many horse owners like to dose their broodmares with ivermectin shortly after the birth. A watch. If the foal hasn’t made progress out the birth canal in 10 minutes, it’s time to call the vet. Read and memorise the typical intervals for the various stages of birth. If the timings are looking suspect, call your vet. Assorted cleans towels. Store them in a dust-free container. If everything goes well, all you’ll need them for is to wipe down the newborn foal. Remember, you’re not the mum! This is her job, but unless conditions are cold or the mare is not overly interested in cleaning up the youngster, you’re generally best to leave the pair to bond. At the very least, you should check and clean out the youngster’s nostrils. Pen and notebook. Write down timings. You might also, for example, be required to write down a phone number for another vet if your regular one happens to be embroiled in a birthing crisis elsewhere. Clean buckets: For carrying water, collecting dirty towels, and other sundries. A tail wrap. A tail is a great tool for a horse, but not during birth. Things will be much tidier if you can get a tail wrap in place before the foal emerges – without causing the mare distress, of course. Be sure to wrap the tail completely, as it’s likely to get pretty mucky. You may even prefer to use a cohesive bandage such as Vetwrap – at least you can simply throw it away afterwards. A large, strong plastic bag, or extra bucket, preferably with a lid. Collect the placenta and put it somewhere where other animals can’t get to it while awaiting disposal. If your vet will be calling the next day, he may want to take a look to ensure it’s complete. Any parts of the placenta left behind in the womb can be a source of infection. Disposable surgical or examination gloves. Try to source sterile ones. You want your hands to be as sterile as possible when you’re handling any part of the mare and foal that could result in infection. Longer-sleeved gloves, called obstetric sleeves, are also available. Lengths of string. Just in case you need to tie off the umbilical cord. Also have some stronger string at hand in case you need to tie up the placenta. Many mares shed the placenta almost immediately, but in others it takes an hour or more to come away. Sometimes it can take three hours. The last thing you want is the placenta dragging around for the mare to accidentally stand on. If she does so, and rips the placenta away prematurely, it can cause damage to the womb. If the mare and placenta don’t part company immediately, gently tie the placenta up, leaving it resting close to the exit of the birth canal. Some people place it gently place in a plastic bag before doing so. Be sure to wear your surgical gloves when handling the placenta. You’ll be pleased that tail is well and truly wrapped up! Enema kit. Foals can occasionally have trouble stirring their bowels into action and passing their first faeces, called the meconium. Whether you have an enema kit on hand – and which kind – is something you need to talk through with your vet. The vet may be able to supply one, or they can be purchased quite cheaply at a pharmacy. If your kit includes a couple of enema kits, you may want to include some water-soluble KY Jelly in case you need extra lubrication. KY Jelly is preferable to vaseline in these circumstances. Be sure that you understand the kit’s use. There are definitely risks to the foal in the incorrect use of an enema kit, as you can damage a foal’s delicate bowel, perhaps even causing death. It is something you should only undertake after taking veterinary advice. It’s entirely possible the vet may want to attend immediately and deal with the problem. Halter and lead-rope. You may need to lead the mare somewhere for any number of reasons. They will prove useful, even if you’re just trying to encourage the mare on to her feet. Sharp, blunt-nosed scissors. You may need to cut string or use them to pierce the placental sac around the foal if it is having trouble breaking out. A sharp knife. It might be easier to use in some circumstances than scissors. Keep the knife tucked away or the blade covered. You don’t want to skewer yourself in the dark. Colostrum. A newborn foal needs colostrum. If the mother is lost during birth, what are your options? Discuss them with your vet before foaling. No-one likes to contemplate the loss of a mare, but it’s important to know what options you have to source colostrum should such a tragedy occur. Mild liquid soap. Some owners, if the opportunity arises, like to wash down a mare’s hindquarters and udder before birth. Ensure the soap you use is very mild, and rinse the areas off thoroughly. The last thing your foal wants in its initial few mouthfuls of food is soap residues. It might be bad enough to stop it drinking altogether. The soap should also be used for washing hands. Antiseptic dip for the umbilical stump. The umbilical stump can be an entry point for infection. To minimise the chances, the stump should be dipped in an antiseptic for a few days. Diluted iodone has fallen out of favour. The traditional 1% mix may be too weak to be truly effective. Some horse owners strengthen the brew, but iodine that is too strong will damage tissue. A good number of veterinarians suggest a dilute solution of chlorhexidine. In the US, a 2% solution of chlorhexidine is sold under the name Nolvasan. There are no doubt other proprietary names. Dilute one part Nolvasan to four parts water and dip the stump regularly three times a day for the first three days. In New Zealand, your local veterinary supply outlet will sell you Vetsep, which contains 0.3% chlorhexidine as well as cetramide. This can be used undiluted for the same purpose. Your pharmacy may stock, or can get in, a product called Chlorhexidine 2%, from Orion Laboratories. It retails for about $9. It should be used in exactly the same way as Nolvasan. Alternatively, pharmacists normally have concentrated chlorhexidine in their dispensary and could mix you a 2% solution without prescription. A small open-topped plastic container. Use it for dipping the umbilical stump. Hopefully, the entire birth will unfold without incident. Horses, after all, managed it for a few million years without our help. If everything goes well, the mare and foal will stay resting for a few minutes, allowing the considerable amount of blood in the placenta to pass into the foal. If the foal is out and breathing, it’s best not to disturb the equilibrium for at least a few minutes. A foal which fails to get its full quota of placental blood can lack thrift for some months. The mare should be up within 30 minutes, sometimes considerably quicker; the foal should be up within an hour and drinking soon after, but it can take up to four hours. It certainly must have its first drink within 24 hours, getting that all-important colostrum. Its first bowel movement should occur within about six hours. Finally, be sure to read up and understand the entire foaling process, because a little knowledge is a dangerous thing. The last thing you want to do is intervene when it’s not necessary or desirable. You are there to assist the process, not take control of it. You need to decide whether a foaling alarm is a good investment. In New Zealand, they cost around $NZ800. Many horse owners view them as a major investment. But what would be the cost of maintaining a broodmare for 11 months, only to lose a foal at the last gasp? What value do you place on the foal? Finally, horse owners should ensure their equine first-aid kit is fully stocked and that none of its contents have past expiry dates. Information in this story is of a general nature only and is not intended to replace the advice of your veterinarian. It is not intended as a foaling guide. First published on Horsetalk.co.nz in August, 2007.